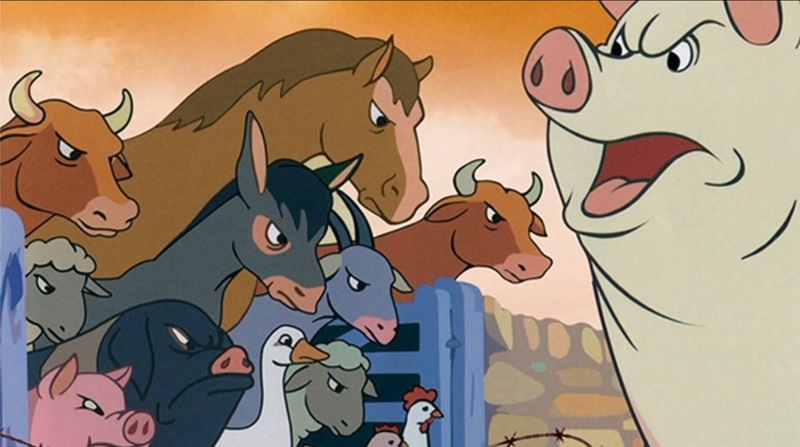 The classic animated interpretation of Animal Farm by British animation studio Halas & Batchelor, captures perfectly the timeless message of George Orwell’s bestselling political satire. Voiced by Maurice Denham, with a sparse, minimalistic style of drawing, it is as magical – and relevant – today as it was when first released. Having endured a lifetime of mistreatment at the hands of the tyrannical landowner Mr Jones, the animals of Manor Farm stage a revolution, taking the ownership and running of the farm into their own hands. It’s not long however before the pigs, led by the authoritative Napoleon, begin to take over, heading a regime even harsher than before. Films date, it’s part of their nature. Inevitably they capture elements of the period in which they are made, meaning that to some degree they remain representative of that moment in time. For many this is their downfall – for others their strength. Such is the case with Animal Farm. During the 1950s animation underwent a period of minimalism. Films like Disney’s Cinderella (1950) and Alice in Wonderland (1951) worked more through suggestion than detailed interpretation of their characters and environments. Such films were not always a resounding successes upon initial release, though many have stood the test of time with their undefined ‘broadness’ appealing to viewers of all ages and generations. Animal Farm falls within this bracket, set in a stark countryside environment which defies pigeonholing as to its specific location and time setting. The farm at the centre of the story, and its nearby village, as well as the rolling hills and surrounding farmland, could be anywhere during any period in post war Western Europe, forming the perfect backdrop for Orwell’s fable of the utopian dream gone sour. The film’s ‘harsh’ style also highlights the underlying bitterness at the heart of the story. An allegory of Russia’s 1917 Revolution, the story highlights the problems with communism: despite the positive idea of ‘equality for all’ and rights for workers – in this case the animals who take over the farm and, initially, run it much more successfully – greed and hierarchical self advancement always take over in the end. The resultant austerity and misery the majority of the animals have to endure whilst the ruling pigs live life to the full is reflected through an atmospherically economic style of drawing which effectively leaves the audience to paint between the lines. Viewed by many as an adult cartoon – upon its release parents were shocked by the bleakness of what they had mistakingly imagined would be another Disney’esque fantasy – this masterpiece of animation still makes a pin-sharp point in today’s society of increasing political and social inequality.